Housed in the Provincial Museum in Victora BC, Canada this wood carving is from the Tsimshian tribe of the Northwest Pacific Coast. 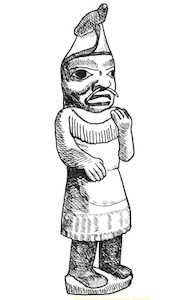 Described as a woman shaman or shamaness, this posture is described as a spirit journey posture. 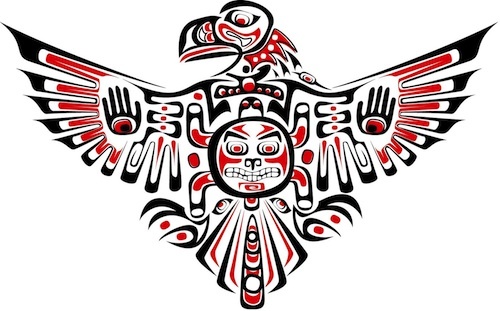 Today, there are approximately 10,000 Tsimshian. Their culture is matrilineal with a societal structure based on a clan system, properly referred to as a moiety. toes straight ahead and knees bent slightly. Right arm: Hold your right arm close to your body and bend at the elbow so that your lower arm extends forward at waist level. The thumb and fingers are held together and the hand is allowed to droop from this position. 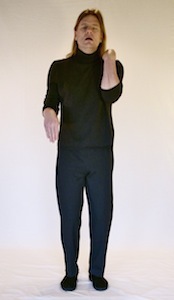 Left arm: Hold your left arm close to the body and bend it at the elbow and put your left hand up to your left shoulder. The left hand also keeps the fingers and thumb together as you rest rest it on your shoulder. Eyes closed, face forward, and allow the mouth to relax, droop open.